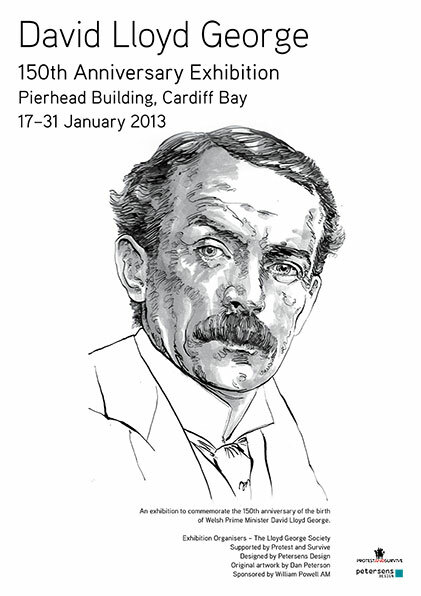 The 150th Anniversary of the birth of David Lloyd George Exhibition opened on 16 January 2013 at the Pierhead Building in Cardiff Bay. The exhibition contains information about David Lloyd George, the most successful Welsh politician of all. The exhibition was curated by Dan Peterson (Creative Director, Petersens Design) and designed by Petersens Design and was put together for The Lloyd George Society and Museum. Petersens Design worked with The Lloyd George Society, William Powell AM (exhibition sponsor), and the National Assembly. There is a collection of political posters and a collection of cartoons by J. M. Staniforth on display along with a group of original portraits drawn by Dan Peterson as well as some political reportage illustration. The launch was well attended by Assembly Members and Ministers and by representatives of the media – television and press. It was well received with many positive comments. The brief was to ensure that in this anniversary year, Lloyd George’s memory is highlighted and his profile raised.